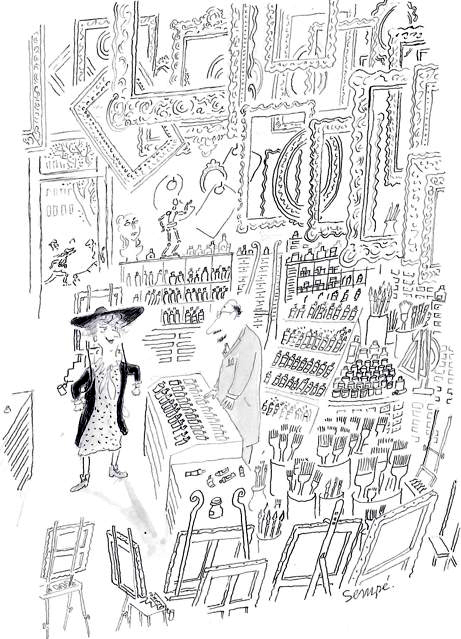 you can now browse into not only two but three amazingly charming and interesting art stores. 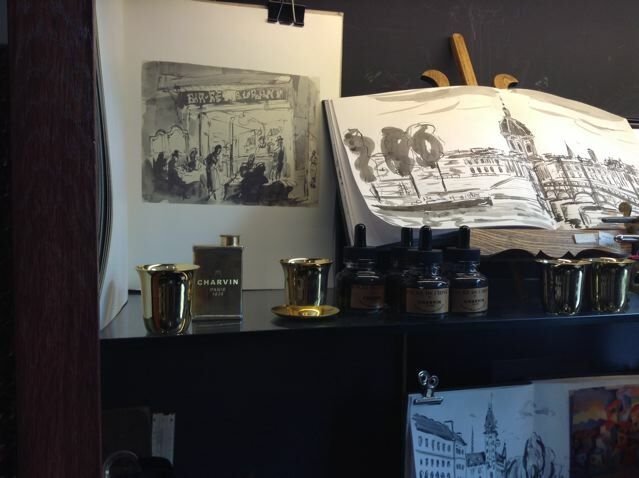 Across from the Louvre, 3 Quai Voltaire, there has always been -since 1887 anyway- the delightful Sennelier shop. 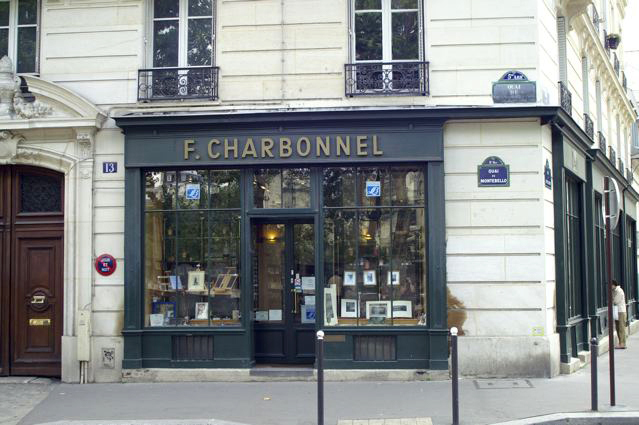 This store was opened even earlier, in 1862, by Francois Charbonnel, a creative chemist determined to compete with improved etching and lithography materials the emerging rival: photography! His inks and varnishes impressed and inspired artists to fight back and, for a while anyhow, won over art collectors and industrialists alike. Manet, Degas or Renoir became his clients, while the beautiful “affiches” Toulouse Lautrec designed were printed with his inks. 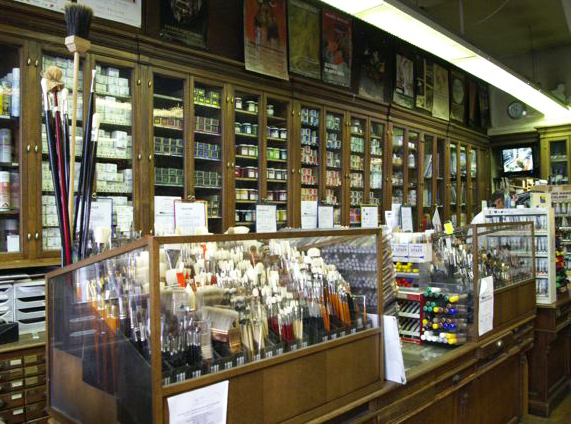 Not surprisingly, the Charbonnel store is still specialized in etching, linocut and other woodblock inks and tools, with the more recent addition of gilding supplies. They also have an impressive selection of papers, so in a way a rather specialized store, although I’ve been told by the salesman that their etching “inks” were more and more used by artists as a super rich oil paint (they then add their mediums accordingly I presume) and I have to share I witnessed a street artist rushing in, brush in hand –and presumably sitter awaiting- to buy a tube! 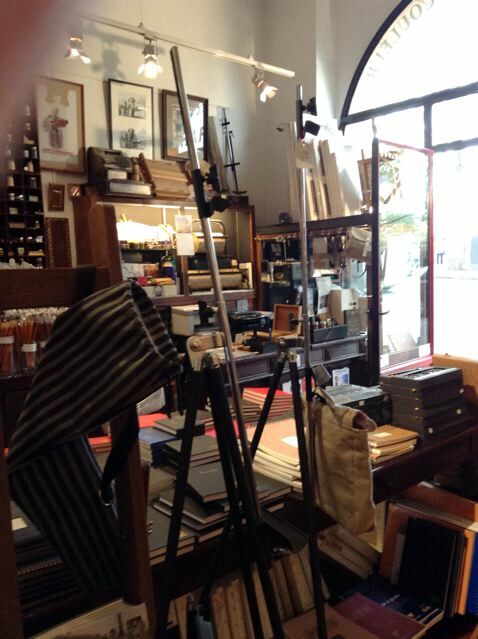 But halfway between these two venerable landmarks of art materials, 57 quai des Grands Augustins, there is now a very charming new store you should not miss: Charvin (with helpful and knowledgeable Jean Philippe behind the counter). Here too they mainly represent themselves, a brand that saw the light of sun on the Côte d’Azur in 1830. Over the next century and a half, it supplied the likes of Cézanne and Bonnard with the vivid colours they needed to depict the strong contrasts of light in the Midi. Then, in 2000, the small company was bought by the present owners, Laurence and Bruno Charvin, a daring couple who decided to revitalize the brand and products sparing no costs on quality. The result is an amazing range of colours (208 shades in their oil range!) which you’ll discover at a glance when entering the shop… the pinks and the greys are to die for and the quality is up to their look! They have chosen an elegant and somewhat old-fashioned packaging, probably to reassure clients about the longevity, authenticity and quality of their -not yet so well known- products. The shop too, with its dark wooden furnishings and gilded lettering, has been designed to make you feel it’s been there for centuries and… it works! What those three delightful places have in common, is the world of possibles they open to you. 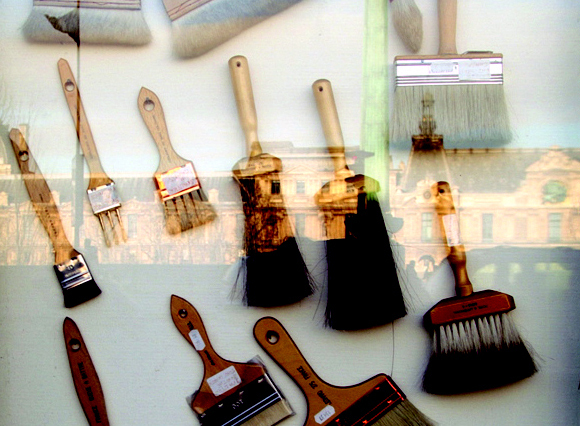 Push their doors and the smell of a “good art store” assail your nostrils… a mingle of solvents, varnishes, oils that somehow elate and inspire. It’s a bit hard to know why and perhaps it’s more in my memory box than yours but I always feel when I get my first shot of that scent that somehow I COULD. I could give the hours to my drawing and other creative projects, I could go wild and press on a 200ml tube as if I was not wasting but knowing what I was going to with that beautiful blob of colour, I could buy half the shop and turn this into a lifestyle… I could perhaps, even, one day, become an artist and go for it (she whispers while laughing at the cartoon below) ah well! PS: and I promise you art stores are the only ones in the world that do this to me! (I NEVER think of becoming a fishmonger in a fish shop or a designer in a clothes shop for example). 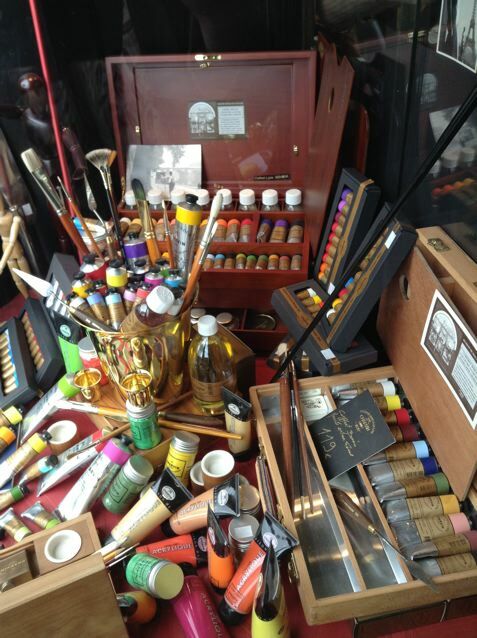 A lovely display of Charvin inks in a “good art store” for sure! Previous Post Gouache… a cheap paint only for kids? How delightful. I was there with you and could see all the tubes and colours too as well as digitalsmell! How wonderful to read your article. I have recently visited Charvin for the 3rd time. Bought my first ‘Paris’ easel from there. 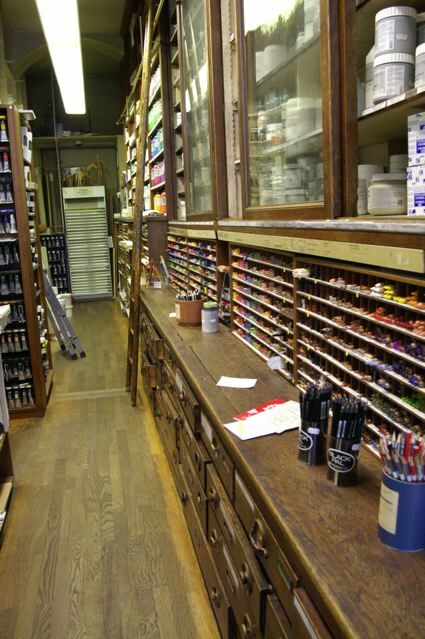 A good art store is like walking into a ‘lolly shop’ for sweet fanatics. I love their service and willingness to discuss the vagaries for novices and experts alike. HI Simone, so sorry this is such a late answer to your nice comment… Yes Charvin is a delightful store and, although new, feels likes it’s been there forever and the man I saw there that day was so helpful too!